Work Them returns to Kraak. Forget Valentine’s, Work Them returns to its original home of Kraak this Friday for its first proper party of 2014. 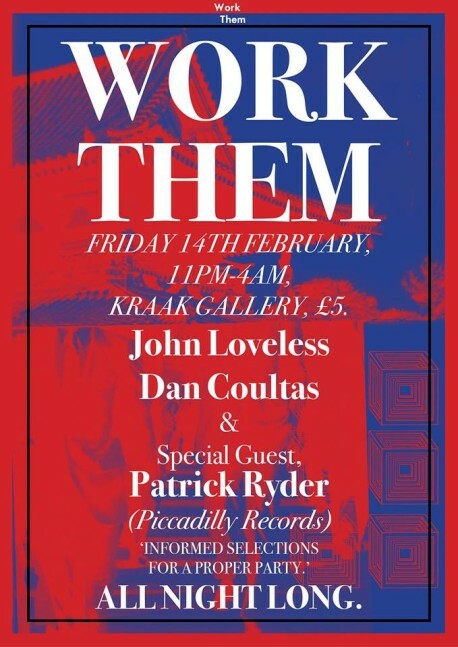 Starting its year in style, John Loveless and Work Them debutante Dan Coultas will be joined by Piccadilly Records’ Patrick Ryder, who returns to the decks with John following their massive set on New Year’s Eve at Islington Mill. Promising an evening of fresh records and genre-spanning mixes, expect nothing short of no-nonsense dancefloor-worthy grooves. And if you can’t wait until Friday, you can preview Patrick’s all-vinyl mix here, featuring Prince, Funkadelic and more. Why spend your evening in a busy, overpriced restaurant when you can throw your best (heart) shapes to these records instead?